PlantSmart. Digital plant care sensor. 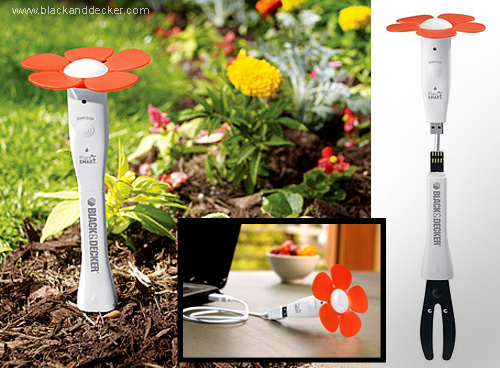 Black & Decker's PlantSmart is a digital plant care sensor that provides detailed advice based on your region for growing and maintaining plants, flowers, vegetables, fruits and trees. The digital sensor uses patented technology to measure sunlight, temperature, moisture, soil conditions and more by simply inserting the testing end into the ground for 24 hours. Readings are then uploaded (via a USB port) to an online database and combined with local and real-time climate and horticultural information to provide custom gardening reports. Dimensions: 89 x 25 x 279mm.